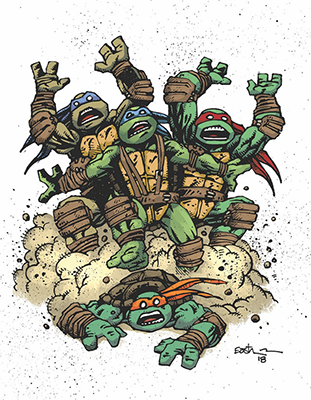 Daily Illuminator: Munchkin TMNT Closes Today! March 21, 2018: Munchkin TMNT Closes Today! There's only a few hours left for the Munchkin: Teenage Mutant Ninja Turtles campaign over on Kickstarter! IDW Games has knocked it out of the park, Casey Jones style, with this campaign, and it's looking to close out strong. If you have been in your shell the whole time and missed it, let me catch you up. You can get Munchkin TMNT Deluxe with color art, or the Deluxe Ultimate edition with duoshade art (like the original TMNT comics)! If you're feeling tubular, you can back for the Cowabunga Bundle, which includes both versions plus a Kickstarter exclusive Kevin Eastman art print and reprinted TMNT comic. But that's not all: IDW has also thrown in some bonus Kickstarter-exclusive characters. You'll get Pigeon Pete, Pepperoni, Slash, and the ever-popular Usagi Yojimbo! Back it today, and make sure all your pizza-loving friends know to back as well; the campaign closes at 7:00 p.m. CDT tonight!